10g of protein. LTA British tennis official snack bar. Gluten free. High in protein and fibre. No artificial colours. No preservatives. Suitable for vegetarians. Nature Valley Protein Cereal Bars contain 10g of protein and are high in fibre Nature Valley Protein Cereal Bars are the perfect on the go gluten free snack for any time of day Why not also try Nature Valley Crunchy Oats & Dark Chocolate Cereal Bars or Nature Valley Nut Butter Peanut Biscuits? Contains 50% less sugar** When hunger strikes, get your Nature Valley Protein Peanut & Chocolate bar, containing 20% of your daily protein needs and 50% less sugar**. This gluten-free better for you snack has 40g of carefully selected ingredients, like wholesome natural peanuts, tempting chocolate and luscious peanut butter, making it a great on-the-go snack for your next adventure. 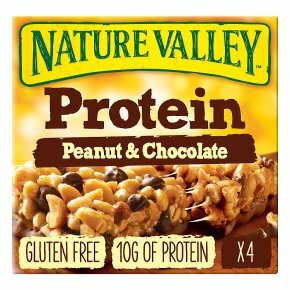 **Nature Valley protein contains 50% less sugar than average adult cereal bars sold in the UK, April 2014 Protein contributes to the maintenance of muscle mass and of normal bones. Nature Valley Protein is high in protein.